Duplicate File Finder - Which files are shown as identical? Which items does the Duplicate File Finder show as identical? What is a duplicate file? A duplicate file is a copy of a file on your computer or external disk that may be stored in the same or in another folder. Duplicate files have absolutely identical content, size and extensions but might have different file names. Almost every computer user who keeps archives of photos, videos, music and documents for a long time (whether internal or external storage) will have duplicate files. But where do they come from? Everything is simple. Imagine you have transferred some photos from your iPhone to Mac twice and, as a result, you have created two folders with the same photos. Or, in another situation, you accidentally created a copy of the document and forgot to delete it. Over time, the number of duplicates may increase significantly so that you may not have enough free space on your Mac. All this means that it’s time to do a total cleanup of your duplicates with Duplicate File Finder. 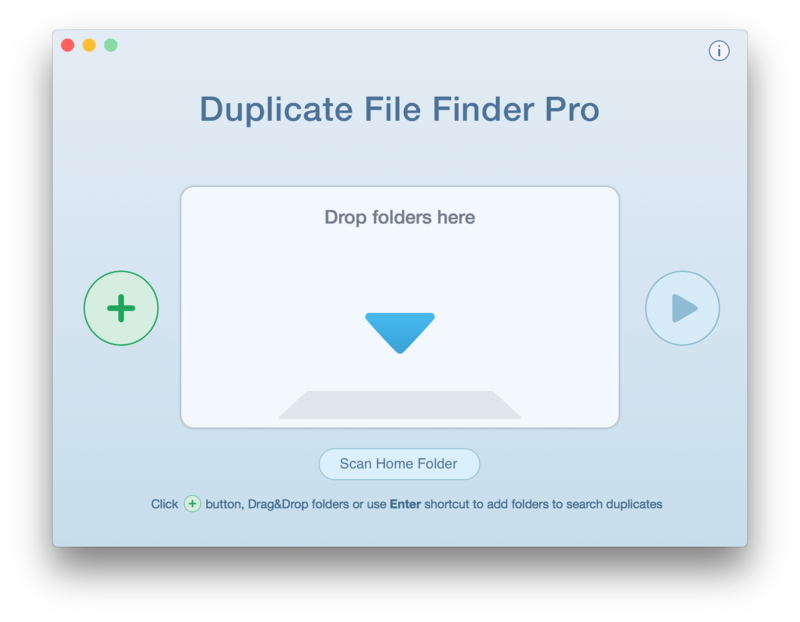 Duplicate File Finder is an efficient application for deleting duplicate files from your Mac. You can download the app for free from the App Store. Or you can make an in-App purchase that gives you the possibility of removing entire duplicate folders as well as finding folders that keep both duplicate and unique files. The application has a powerful algorithm for searching for duplicates, and it works very fast. All you need to start scanning is just drop your folders or external disk into the application window and click the Scan button. It will take less than a minute to get the results. Secondly, Duplicate File Finder compares files accurately using two main characteristics – their sizes and extensions. In the first step it finds the files of the same file extension type, then it compares their sizes byte to byte. If two or more files with the same extensions have the same size, they are then compared with their data. It is erroneous to assume that files with the same name are duplicates. The application never takes the filename into account because computer users can always rename identical files or give different files the same name, so the results would not be accurate. Let’s take an example. Imagine you have two files with the same extension and name that you think are duplicates. 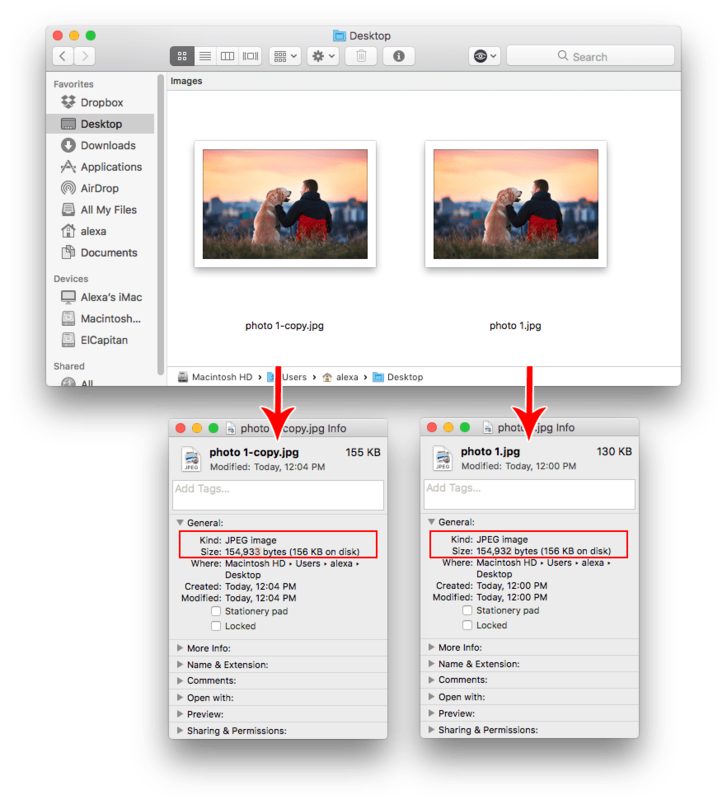 However, if you check their sizes (use Command+I shortcut in Finder), you will find they have different sizes and are therefore not identical files – the difference is just one byte. Duplicate File Finder doesn’t display files as duplicates even if they differ from each other by only one byte. 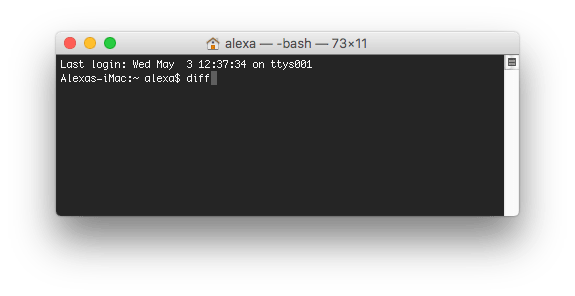 Launch Terminal and type in the window the command diff. Drag and drop your files to the window. Press the Enter key and you will see a notification, as in the screenshot, that file photo 1.jpg differs from file photo 1-copy.jpg. With the same command, you can also compare folders to find duplicates in them. There is also special content comparing software (for example via the DiffMerge application) that you can use to check the accuracy of Duplicate File Finder’s results. However, if you still disagree with the duplicate results, send your files to our support team and we will research the issue. Quick tips to select and remove duplicates. Clean up Similars – folders with duplicate and unique files.